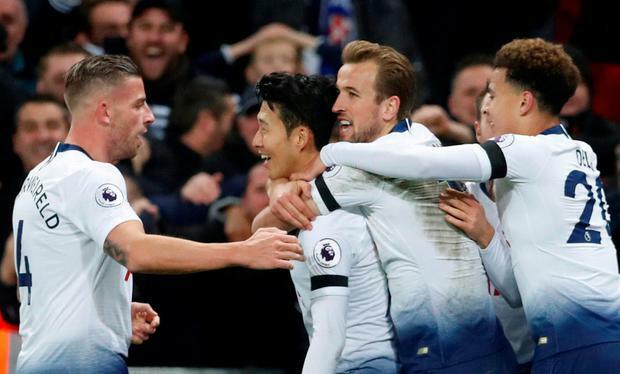 Tottenham put on a scintillating display to unceremoniously end Chelsea's unbeaten start to the Premier League season with a 3-1 win at Wembley. Spurs climbed above Maurizio Sarri's men with a performance that showcases their own potential to challenge Manchester City and Liverpool at the top of the table. Goals from Dele Alli and Harry Kane put them two up inside 16 minutes and Son Heung-min made it three after the break with a brilliant solo goal. It was a 10th win from 13 games this season for Mauricio Pochettino's men and the rampant showings of Kane, Alli, Son and Christian Eriksen will have the Argentinian licking his lips at the prospect of what might be to come. They could have won by a far bigger margin had it not been for some wayward finishing and some impressive saves from Kepa Arrizabalaga. Chelsea were a shadow of the side that had not tasted defeat in their opening 12 league games, though did bag a late consolation through Olivier Giroud, and Sarri will now have to contemplate his first loss in the Blues dugout, having only previously lost in the Community Shield against Manchester City. Spurs have often been accused of struggling against the top teams, losing to City and Liverpool, but that could not be levelled at them here as they made a rampant start that left Chelsea shell-shocked. Alli's love affair with scoring against the Blues continued as he headed his side in front from Eriksen's wicked free-kick at the near post for his sixth goal in five appearances against them. Son had two chances to double the lead but blazed over from a brilliant position and then saw a low shot blocked by Arrizabalaga after the South Korean had skinned his marker. The Chelsea goalkeeper was a spectator soon after as Spurs did make it two, with Kane thrashing in his sixth Premier League goal of the season in the 16th minute. The England captain sent a low shot into the bottom corner from 25 yards, with Arrizabalaga, who can only have had his view blocked, statuesque as he watched it fly past. The Spaniard soon showed why he is the world's most expensive goalkeeper, though, as he produced an instinctive stop to keep out Toby Alderweireld's point-blank effort, with Juan Foyth's audacious flick from the rebound drifting just wide. After Chelsea briefly threatened with Eden Hazard testing Hugo Lloris from the edge of the area, Arrizabalaga was at it again with another superb stop to again deny Son. Alli and Eriksen worked the ball superbly to the South Korean whose low shot was brilliantly palmed around a post. Son eventually got his goal nine minutes after the restart and it was a beauty. Set free down the right by Alli, Son out-sprinted Jorginho then made a fool of David Luiz before coolly slotting home. As Chelsea pushed forward, even more gaps opened up for Spurs on the break and they should have racked up a rout. Kane inexplicably missed from close range as Serge Aurier put it on a plate for him and then Alli curled an effort just wide from a fine position. Giroud gave Chelsea something to cheer about in the 85th minute as he headed home Cesar Azpilicueta's cross, but the damage had been done.